Spring is here — take some time to brighten up your apartment with these tips. NEW YORK CITY — With the dark days of winter (hopefully) behind us, it’s time to clean out all the tracked-in salt and grit and prepare our apartments for warmer days. Perhaps you’ve already gotten swept up in the cleaning spirit thanks to newly-minted organizing queen Marie Kondo and her best-seller “The Life-Changing Magic of Tidying Up” — a book, translated from the original Japanese, that rapidly achieved cult-status. If her tidying tenets have you feeling intrigued but haven’t succeeded in inspiring you to finally toss those Christmas cards, we’ve rounded up some tips from longtime New York City organizational experts, to get your “Kondo-ing” — or, you know, cleaning, in motion. Cleaning windows and clearing away windowsills is a great way to start the process of lightening up your apartment, experts said. Washing your windows, inside — and out if you can — is an easy means to make your apartment feel brighter. Clearing windows, and windowsills, throwing out wintry knickknacks, lingering magazines or never-read books that might be taking up space, is a “small, simple and impactful” way to start a larger deep-clean, organizer Maeve Richmond said. Once you’ve cleared away a winter’s layer of grime, add some flowers to the apartment to bring some of the spring inside to keep you inspired in the cleaning process, said Nancy Heller, a Manhattan-based organizer. It might also be time to change up your curtains, in favor of lighter materials, Aron suggested. Whether it’s in your hallway closet, your bedroom, your living room or your kitchen, there’s likely a layer of winter still lying around. Aside from the dust, which you should wipe down everywhere, there are likely heavy coats, boots, sweaters, kitchen appliances — that it’s time either put away or purge. Aron recommends checking for repairs that need to be made to your winter wear — resoling those boots or fixing a button on a jacket — before you store. “Get those things done now. It’ll keep your things in better shape and it’ll make you happy when you have those things ready to use for next winter,” she said. Experts said it's often not easy for people to throw things out, or give them away, but, ultimately, the process of purging and organizing helps you “live with more clarity,” Aron said. “Marie Kondo has this question ‘Does this spark joy’,” Aron said “It’s her way of asking what I think is what a lot of professional organizers believe — you should only have things that surround you that really make you happy — everything that takes up space in your small apartment should have a reason for being there." People often have a hard time with certain items like gifts, for example, that they may feel guilty about throwing away. But, experts said, you should say thank you to the gift and the sentiment behind it, then let it go if its just taking up needed space. Cleaning and organizing can be a big process — from your closets to your kitchen cabinets — there can be a lot of switching out and throwing, or packing, away. But experts say it's important to just take it in manageable chunks. Aron likes working in three-hour blocks of time. She suggests being strategic about which area you clean first. Heller suggests hitting the bedroom first, because it’s a “place that should be quiet, and a cluttered bedroom can have a bad subliminal effect on someone.” Clearing away unnecessary knick-knacks and papers from bedside tables, switching to lighter sheets, are all ways of making your room feel a bit more zen. Whatever you do, it's important you do something, and start now, experts said. 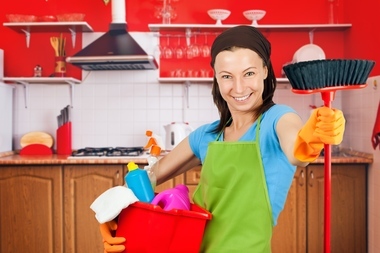 "Think of spring cleaning as the start of bikini season for your home," Aron said with a laugh. "Keeping organized is really like weight management, once you get it off, you've got to work at it."